We could not be more excited to announce the forthcoming publication of Go Set a Watchman, the new novel from Harper Lee, 55 years after To Kill a Mockingbird. Lee’s second book, Go Set a Watchman, was written first, and To Kill a Mockingbird was born from its flashback sequences. The sequel, whose title is taken from a biblical quote, tells the story of the same characters from Mockingbird, featuring a grown-up Scout now living in New York. Harper Lee says: "In the mid-1950s, I completed a novel called Go Set a Watchman. It features the character known as Scout as an adult woman and I thought it a pretty decent effort. My editor, who was taken by the flashbacks to Scout's childhood, persuaded me to write a novel from the point of view of the young Scout. I was a first-time writer, so I did as I was told. I hadn't realized it had survived, so was surprised and delighted when my dear friend and lawyer Tonja Carter discovered it. After much thought and hesitation I shared it with a handful of people I trust and was pleased to hear that they considered it worthy of publication. I am humbled and amazed that this will now be published after all these years." Instant reaction to the announcement has been mixed. While many fans of such a seminal novel are delighted, others, who have treasured the tale of the charismatic lawyer Atticus Finch fighting racial injustice in the American deep south, are not best pleased by the thought of a sequel. Go Set a Watchman will be published on 14th July 2015. 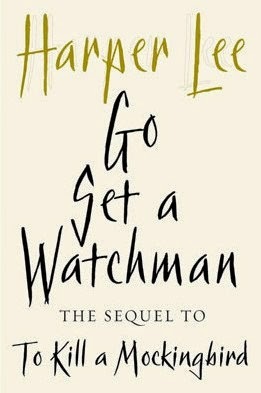 Go Set a Watchman will be published in the UK by William Heinemann, the original UK publisher of To Kill a Mockingbird.